A few months ago, I picked up a starter license for HipChat Server out of curiosity. As I use a few other Atlassian products, such as JIRA and Bitbucket Server (aka Stash), I figured it would be distributed similar to their other applications (a self-extracting script). However, HipChat is distributed as an OVA package (Open Virtual Appliance). The file itself is just a tarball containing a few vmdk (VMware) disk images, a checksum file, and an XML description of the contents. If you're using VirtualBox or VMware, the OVA package can be opened without a problem, and the XML description provides all of the necessary information to create a pretty interface and construct a compliant virtual machine. However, if you're using Xen or KVM/QEMU, you'll need to do a bit more work to make this work properly. This guide assumes you have a working knowledge of how to create virtual machines with libvirt, currently have a working host with an LVM2 or QEMU storage pool, and a bridged network configuration. This guide was written using a Debian 8 host, but can be easily adapted as needed. Most of the commands herein should be run as root, or via sudo. Depending on the type of storage pools you have configured (if any), only one of the following two sections should be performed. If you don't have any storage pools configured, use the QCOW2 section. If using LVM2 as a backing store, create a new LVM logical volume for each disk image (change the name and volume as necessary). Below is an example of the disk configuration for LVM2. Click here for a full example, including Spice console access. It should be noted that it doesn't really matter which target devices are associated with the disks, as all partitions on the system image are mounted via UUID, and the other volumes are part of an LVM2 pool that has been pre-configured on the system image. If your network does not use DHCP, then you will want to ensure that the VM is configured with a Spice or VNC console. 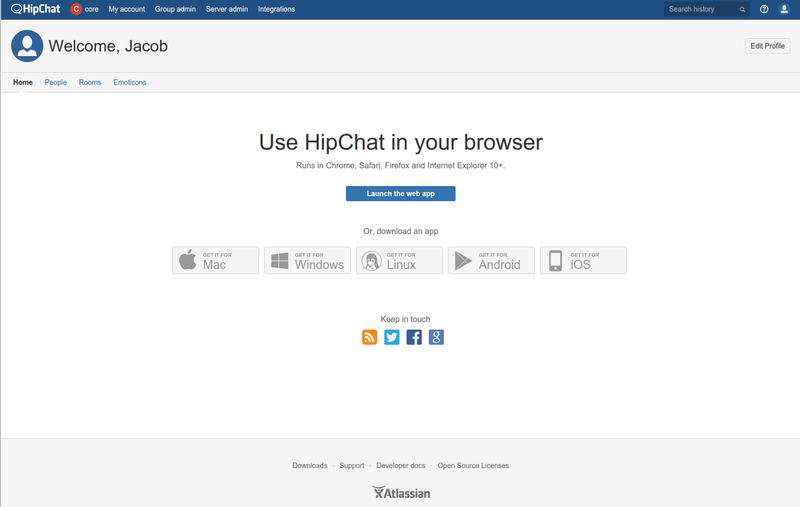 On initial startup, you will need to login to the VM with the username admin and password hipchat. Once logged in, you will be able to set a static IP address, and configure the hostname. Once this has been done, you can complete the setup by accessing the web interface via its IP address or hostname you have assigned it (assuming the DNS entry has been added on your DNS server). Unfortunately, my network configuration requires adding an additional route to allow traffic to be passed to the gateway (eg. with OVH). See this article on how to accomplish this so that your changes are not obliterated the next time Chef runs: How to force network configurations and routes. /usr/sbin/sudo /bin/dont-blame-hipchat -c "/sbin/route add 149.56.21.254 dev eth0"
/usr/sbin/sudo /bin/dont-blame-hipchat -c "/sbin/route add default gw 149.56.21.254"
You can then run the script to immediately add the routes, or reboot the VM if you want to be extra-sure it works. Once networking has been configured and your machine is reachable from the Internet, complete the setup by visiting the IP or hostname of your new HipChat server in a web browser.